Jocquez Bruce runs for 44 yards early in the first quarter. Photo by Adam Sullivan. Jocquez Bruce still had the bitter taste of losing on his tongue when he walked onto the field at South-Doyle in Friday night’s matchup against Cocke County. “We knew we were going to win this game. After losing last week, we didn’t want to lose any more,” said Bruce. The enthusiasm didn’t take hold until the second quarter after the score at the end of the first quarter was 0-0. It would take a defensive pick-six for 54 yards from South Doyle lineman Dennis Mongon in the second quarter to ignite the Cherokees into putting points on the board. South Doyle earned a shutout over Cocke County 41-0 in South Knoxville in a game that featured two defensive interceptions returned for touchdowns. 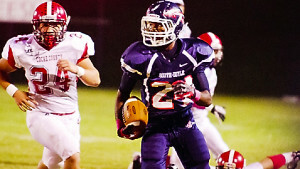 The second interception came in the fourth quarter by Jocquez Bruce, South-Doyle’s big-time running back. “I felt like I let my team down last week and this game I came out and said I was going to give 110% and some more,” said Bruce. South Doyle was still dwelling on their first loss of the season throughout the first quarter. Cocke County recovered a fumble on their own 23-yard line, followed by a fake punt on fourth and nine from their own 29-yard line. In the second quarter, Mongan’s pick-six would lead a four-touchdown campaign to put the Cherokees up 28-0 at halftime. Quarterback Brody Rollins would keep the ball for two of the touchdowns from the 2 and 9-yard line. Samuel Perry would also run a touchdown from 8 yards. Cocke County would gain some momentum to open the third quarter after recovering a Jocquez Bruce fumble at the 48-yard line and the subsequent march down the field with the aid of a horse-collar penalty on South Doyle. However, on fourth and 11 from South Doyle’s 15-yard line, Jacob Jones would break through the line and force a turnover on downs. South Doyle would score on the ensuing set of downs on a Jocquez Bruce touchdown run from 4-yard line to the Cherokees up 35-0. “We saw that they were keying in on me when I went in motion, so when we figured it out, we had some other plays come in to give yards to Malik and Brody,” said Bruce. It would be Bruce, who had a fumble and a touchdown on the previous set of downs, who comes up with the interception to seal the game at 41-0 after a missed extra point. South-Doyle makes the quick trip down Chapman Highway to rival Seymour next week for a division matchup. Seymour is 4-3 but just 1-3 in league play.